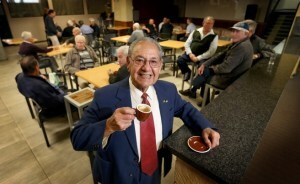 Sipping coffees, a group of Italian men in their 90s are chatting about life . . . and soccer. It’s practically their daily ritual. For some, the member’s area of the WA Italian Club has been like a second home since moving to Australia decades ago to ensure a better future for their family. “It is their place … it’s like them being at home in their lounge room,” committee member Christine Madaschi explained. Italian Consulate Adriano Tedde yesterday helped the club celebrate its 80th anniversary by unveiling a plaque in honour of the organisation’s contribution to the Italian community.